Some tropical reptiles may be able to adapt quickly to climate change rather than go extinct as widely expected, a Dartmouth-led study finds. The research is the first direct measurement of climate-driven natural selection on the thermal physiology of a wildlife species – in other words, survival of the fittest in an increasingly warm world. "In recent years, an ever increasing number of studies have added to a growing scientific consensus that tropical plants and animals are particularly vulnerable to warming," says lead author Michael Logan, who recently received a PhD from Dartmouth and is now a National Science Foundation postdoctoral research fellow. "However, the potential for organisms to evolve in response to a rapidly changing environment is often downplayed, even though very few experimental studies have examined the extent to which species might be able to adapt." Cold-blooded species, whose body temperature fluctuates with the outside temperature, are used to a relatively stable climate in the tropics, so even small environmental temperature increases may cause heat stress and push them toward extinction. Previous studies suggest these species may lessen the harmful effects of warming through evolutionary adaptation, but it is unclear whether they can evolve rapidly enough to keep pace with global warming. To tackle this question, the researchers measured natural selection in real time in two wild populations of brown anole lizards on islands in the Bahamas. One population was left in place. The other population was transplanted from a relatively cool interior forest to a warmer peninsula nearby with a greater range of temperatures, which mimicked the rapid onset of climate change. Lizards must move quickly to catch prey and elude predators, so before transplanting the population, the researchers took each lizard back to the laboratory and measured how its running ability related to its body temperature. They predicted the lizards that ran fastest at warmer temperatures, and across a broader range of temperatures, would be more likely to survive the harsher environmental conditions of the peninsula. Their predictions proved accurate: The transplanted lizards that ran fastest at warmer and broader temperatures had a higher survival rate through the breeding season. 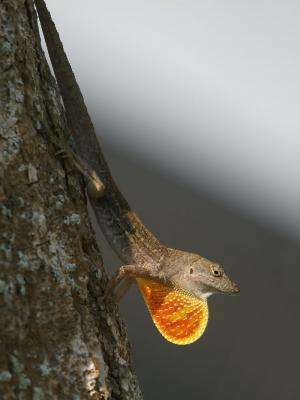 The researchers surmised that while the transplanted lizards were heat stressed, the faster ones may have increased their survival chances by remaining active longer during the day – thus permitting more time for food intake and outcompeting rivals—and by being better at evading predators. "Although there has been a tremendous focus on the impact of climate change on natural populations, our study is the first to take an experimental approach towards understanding how evolution might compensate for some of the effects of warming," says Dartmouth Associate Professor Ryan Calsbeek, the study's senior author. "Our data suggest that in some cases, natural selection will be very strong and might drive rapid evolution in response to the changing environment." The researchers' next step is determining whether the faster, more heat-tolerant lizards pass on their speedy characteristics to their offspring. "We found that not only can human-induced climate change exert natural selection on wild animal populations, but that this selection can be quite strong," says Logan. "This means that, if the traits under selection can be passed on from parents to offspring, rapid evolutionary change may be a critically important means by which some animals can resist the detrimental effects of global warming." "Even if the amount of warming expected through the end of the century occurred during a single breeding season, this species could hypothetically compensate for as much as 30 percent of that environmental change through evolutionary adaptation alone," according to the study. "Nevertheless, there is a paucity of data describing the genetic architecture underlying thermal performance curves for most species, and these data will be critical for predicting the evolutionary responses of ectotherms to climate change." In a 2013 study, Logan and Calsbeek measured the impact of microclimates, rather than global environmental temperatures, on four species of lizards in Honduras. Their results suggest climate change may have little impact on many species of tropical lizards, contradicting a host of other studies that predict their widespread extinction in a rapidly warming planet.